The potential new labor deal for Major League Baseball is a great start towards revitalizing baseball and leaping possibly into the number two US sport behind the NFL. Moreover, the deal could be the start of building an enterprise that can endure. I actually love baseball and in particular going to summer evening games with friends and family to take in a game and commiserate. So take all this as just the ramblings of a punch drunk Braves fan looking for a better way. Baseball is doing OK, but their ratings and attendance are sinking. Regional college football games beat out the world series games, which turned out to be insanely dramatic and entertaining. Beyond the pros of the labor deal, there are a few suggestions I would like to recommend for taking MLB to the next level centered around 4 areas; length of season, number of games, playoff format and parity. Introduce a strict 6 month season. 5 regular season and 1 post season month. Begin the season on May 1st & end by October 31st. Condense the season to 100 games. Capped at 20 games a month per team (10 home and 10 away). Limit games to Tuesday, Wednesday Friday, Saturday, and Sundays. Fewer games means a higher demand to see them and increased revenues. Go to a 12 team playoff. 6 teams from each league. This format replicates the NFL playoff schedule as a template. More teams in the playoffs will mean more fans who feel apart of the post season and higher viewership. Lastly, the league has to develop better parity like the NFL and the how’s of achieving this goal remain the most contentious amongst owners and between them and the players. Apply a Revenue Sharing model and alternatively work together to create collective merchandising deals for the league as a whole (i.e a single uniform vendor). The league has to undergo contraction. Financially under performing franchises should be removed: Tampa Bay, Kansas City, etc. A salary cap and/or a salary spending minimums should be introduced to level the playing field. I think even instituting half of these changes will go a long way towards making baseball relevant again in the eyes of the most crucial fan, the passive one. The fan that has other interest but will catch at least the home team game because they prove regularly entertaining. Capturing this type of fan is what has made the NFL so successful; Mom, the nerd, flaky kids, and the bored serial TV watcher. Every game needs to become important and tickets a more elusive commodity for more than just the Red Sox and other elite teams. In the end, the most effective thing that can happen to fix baseball is for fans to speak with their wallets. 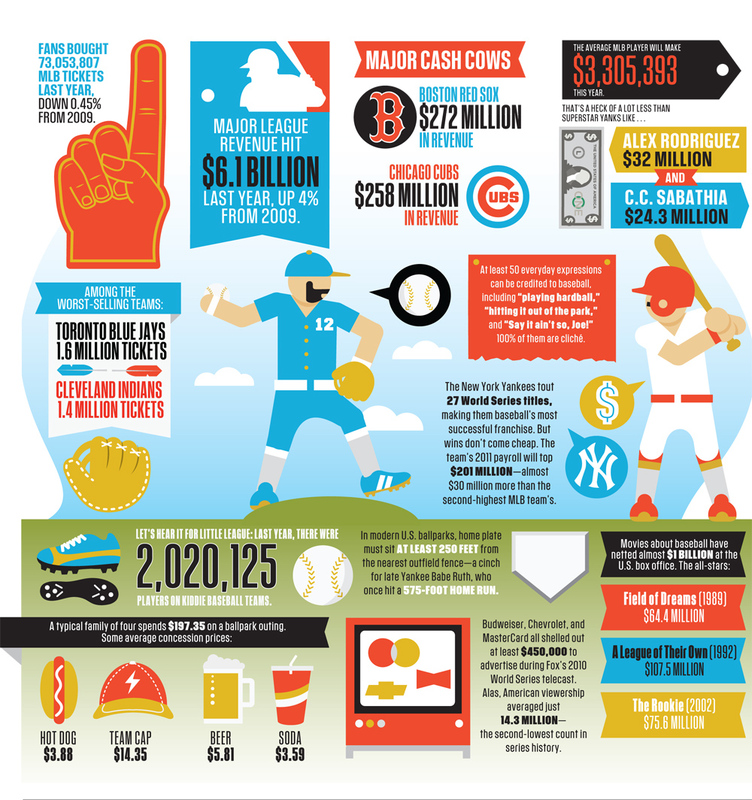 Baseball did over $6.1 billion in revenue. As long as fans keep spending that kind of coin, the owners and commissioner will be slow to change. Hold your wallets back just a enough, to force progress. See below for a breakdown of the MLB’s numbers or follow this link for a larger image. P.S. Some additional non-mission critical and purely venting changes include getting rid of Selig and moving the Braves towards the Perimeter near to the site of the old GM plant (or build a Marta station at the current stadium).